London-based start up Musaic has unveiled its first wireless Hi-Fi range. The range will play music from a wide range of steaming apps and devices, including iOS and Android devices. It was unveiled at the Consumer Electronics Show in Las Vegas. In addition to smartphones and tablets, it will also be able to stream music from Macs, PCs, UPnP/DNLA servers and NAS drives. It will also support Napster, Rhapsody, Grooveshark and SomaFM. The system is made up of a range of wireless music players in a variety of sizes. They can be group to play the same music at the same time. At the top end, the Musaic MP20 Player will feature five separate digital amplifier channels and acoustics that the company claims will match traditional Hi-Fi systems. The players make use of Digital Signal Processing, resulting in high sound quality. The Musaic HS20 Home Server completes the line-up. Users can opt to store and back up all of their content and play it through the system without the need to have a computer turned on. The system is controlled via free bespoke apps compatible with both Apple™ and Android™ devices. The Musaic Control apps will allow customers to browse artists, albums and tracks, create playlists, and control where their music is played. According to the company, the apps also allow customers to browse, play and set favourites from more than 20,000 internet radio stations. Musaic was sounded by Matthew Bramble, who has an extensive background in consumer electronics. 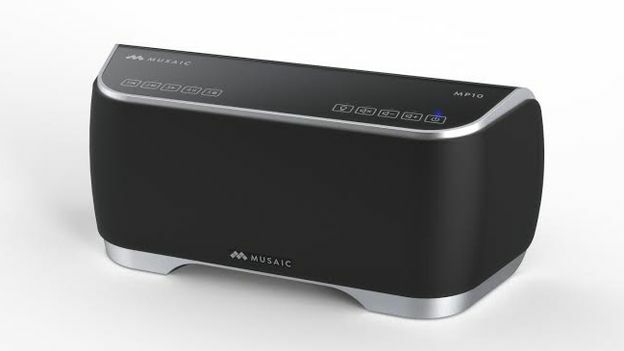 “Musaic is, at its heart, simply a great sounding music system,“ said Bramble. ”We wanted to design a wireless HiFi system that's stylish and compact, and that would deliver incredible sound in every room.